ETECH CONTROLS CORPORATION manufactures Secure-Tech state-of-the-art modular electronic communication and control system products to meet the specialized needs of modern justice and correctional facilities. Over one-hundred modular electronic function products, and end-of-the-line communication devices, are currently available to provide for the integration of control, monitoring, and communication systems. Secure-Tech's product line has been the industry leader in innovative off-the-shelf solutions for every detention electronics need for over thirty-five years! Custom engineered control electronics assemblies, and their mating control panels or touchscreen type operator interfaces, are available as turnkey products, labeled for field wiring connection and factory tested to assure that they provide the intended functionality. All Secure-Tech products and assemblies are manufactured using the highest quality materials and construction methodology. Secure-Tech products have a reputation for quality and reliability that is backed by over thirty-five years of proven dependability and unequaled customer support. Secure-Tech's history goes back to 1972, when an electronics design team, led by an ex-NASA electronics engineer, accepted the challenge to develop a modular line of electronic control products, specifically for detention facility applications. This original product line was completely solid-state, and handled most of the intercom and door control functions that are prevalent today. A fully distributed microprocessor based products design was introduced in 1976, using the revolutionary (now an industry standard) RS-485 data protocol, which allowed unprecedented four-thousand feet data runs, between each of many microprocessor based controllers located throughout a facility, via a single twisted pair of shielded conductors. With a continued focus on systems reliability and integrity, highly redundant microprocessor based designs were introduced to the product line in 1982, which utilized not only fully redundant microprocessors, but also separate redundant communication circuits and power supplies. Secure-Tech's first large-scale touchscreen operator interface detention facility project was completed in 1988, incorporating a total of seven touchscreen terminals. Each of these touchscreens were capable of full facility control, and were interconnected via redundant communication servers and data paths. Over one-hundred stand-alone distributed processors were incorporated, so that all remote detention housing area controllers would remain operational even in the event of a total failure of all touchscreen based central control terminals. These were highly innovative systems for their time. And, due to their solid-state circuitry, high reliability design, and Secure-Tech's guaranteed technical support, were still working properly when replaced in 2006 to match a new "sister" facility. Secure-Tech products and systems remain at the forefront of the industry for quality, innovation, and proven reliability. 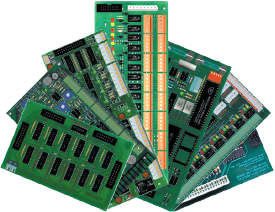 No other brand of equipment can compare with the diversity of industry specific features, options, and capabilities that are available in Secure-Tech's off-the-shelf electronic modules and assemblies. The vast majority of Secure-Tech’s product line features all plug connection. All conductors attached to an individual module can be disconnected and re-connected in less than sixty seconds. This makes the troubleshooting and replacement of failed system components easy to accomplish, using on-staff facility maintenance personnel. Secure-Tech opto-isolates all end-of-line field device signal input points to 7500 volts. Optimization is a quality and reliability design feature that Secure-Tech believes will save you money, during both initial installation and long-term maintenance. This feature provides the ability to stop dead shorts, wrong voltages, and other mis-connections, from destroying multiple system components, and is also helpful in minimizing the damage caused by lightning strikes. Damage is isolated to the initial field wire connection point, and is not allowed to continue on causing further damage to other internal system components. All Secure-Tech products are functionally tested before shipment to our customers. This insures that when you receive products manufactured by Etech Controls to meet the Secure-Tech standard, they are guaranteed to perform the intended functionality, when installed for use in the proper application. The use of Secure-Tech products significantly reduces project engineering, material, installation and long-term maintenance costs. Our products are available as individual function modules or as pre-engineered kits for assembly by the Systems Integrator that are ready for field installation, using COMPLETE EQUIPMENT DOCUMENTATION provided by Etech Controls Corporation. Our product catalog, and attendance at our FREE TRAINING SCHOOL CLASSES, provides the Systems Integration contractor with the knowledge required to design, install, and maintain integrated security systems equipment, for specific applications using our products. Architects, Engineers, and Consultants can also benefit from the knowledge to be gained at our free training school classes, and then rest assured that they are serving their client's interests best by specifying Secure-Tech products as THE HIGH STANDARD of quality, reliability, and long-term maintainability, that is required to be provided on all of their projects. Etech Controls supports every system ever installed with Secure-Tech systems, for the lifetime of the facility! We are so confident in the reliability of our products that we provide an extended TWO YEAR WARRANTY, and LIFETIME TELEPHONE TECHNICAL SUPPORT to all end users! This warranty conveys to our customers that Etech Controls is committed to providing high quality products, and to the long-term satisfaction of the end user. Secure-Tech's research and development engineering staff continues to provide new and innovative product solutions to address the needs of a changing detention facilities marketplace. Application specific products, in either discrete or programmable functionality, and modular format, are under constant development. Present us with your special application product requirement and we will engineer a solution for you! Call 800-800-2523 or email sales@etechcontrols.com for a quote.